I can point to two times when I specifically and successfully asked “The Universe” for its help in making the seemingly improbable appear. One of them occurred on a 2015 vacation to Nashville, Tennessee. On a Monday in May of that year we were watching the final episode of Nashville season three and I told my wife that I’d like to meet actress and musician Lennon Stella on the streets of Music City on our upcoming trip there. Through some strange machinations over the course of that week I actually bumped into her in East Nashville four short days later. Skip ahead to 2017 and Lennon and her sister Maisy are heading into their sixth season as America’s sweethearts on Nashville and they have adroitly thrown their hat in the ring to become the next queens of country thanks to their break-out performances on the weekly scripted drama that – much like Lambert in similar format – has allowed them to show off their ample musical chops. 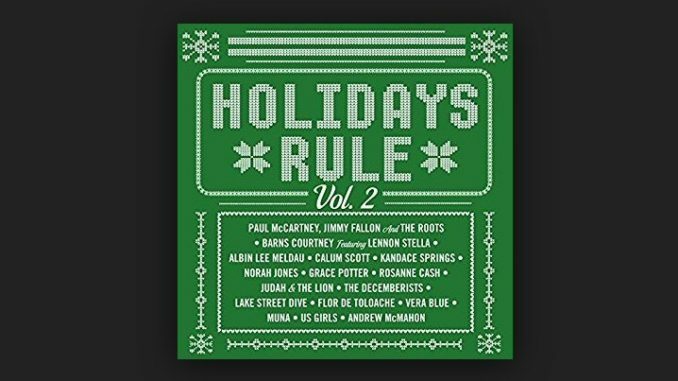 Laura and I now reside in Tennessee and in 2017 Lennon has a cut on the eclectic and daring Holidays Rule Volume 2 out now from Capitol Records where she joins Paul McCartney, Jimmy Fallon and The Roots; Norah Jones; Grace Potter; Rosanne Cash; The Decemberists and many more on this 16-track compilation that is fast becoming recognized as the Christmas Collection of the Year for its unusually rich assemblage of Pop, R&B, Rock, Americana, Jazz, Mariachi, and more. Lennon recorded “Baby It’s Cold Outside” with an artist named Barns Courtney. At one minute and 56 seconds the expedient remake of the Christmas classic carries the combination of Lennon’s lilting delivery along with Barns Courtney lower in the register doing the heavy lifting. The modern yet warm retelling finds this couple as perfect a pairing as Rudolph and Santa during the holiday season. Maybe it will turn into a tradition. Speaking of traditions, two years after meeting with Lennon, Rich had the honor of visiting with Maisy on the Gibson Guitars bus as part of the 35th Annual Kids Show in Henedersonville, TN on December 11, 2017. This yearly event allows fans to meet up with over 50 country music stars and upcoming artists on an assortment of high-tech and nicely furnished tour buses that the stars of country use to bring their craft to the world. Past participating artists have included Chris Stapleton, Gretchen Wilson, Chris Young, Taylor Swift, Wynonna and Naomi Judd, Trace Adkins, Trisha Yearwood, Darryl Worley, Jeff Bates, Larry – The Cable Guy and many, many others who have shared in this timely charitable act. Funds gathered were to fund a trip the following day by over 400 underprivileged children from 29 different schools around Middle Tennessee who were to participate in a day-long shopping excursion, a special chauffeured ride from their school aboard an entertainer’s luxury tour bus, dinner, and a party hosted by Santa and Mrs. Claus. To wrap up the day, the tour bus journey journey to the Hendersonville Walmart, where the kids received a brand new winter coat, and $150.00 to spend on anything they like. Christmas 4 Kids is a not-for-profit organization that has been in existence for 35 years providing many children, each year, with a very special Christmas gift. On the bus, Rich told Maisy that in light of the cancellation following 2018’s scheduled sixth season he’d like to see a variety and talk show with the sisters and possibly Nashville star Charles Esten. Someone aboard then said, :”Yeah, all the country music stars will come to play with them!” That would fun – hope CMT is reading! Prior to moving to Nashville reporter Rockin’ Rich Lynch had three goals he “put out to the Universe” according to the workings of The Secret. They were (1) to continue develop songwriting skills, (2) to continue excellence in reporting on the music industry, and (3) to ramp up his own pursuit of a recording career. Guess what? It’s working! The indie artist recorded 10 digital singles in 2017 with an eye on a break-out early next year. “I think for 2018 I should ask the Universe to record a track with Lennon and Maisy,” Lynch said after prepping this report for MCN. For the Nashville via New Jersey rocker that wouldn’t be the first time his dreams came true. Stay tuned. Musician and MCN founder Rich Lynch meets Lennon and Maisy two years apart.